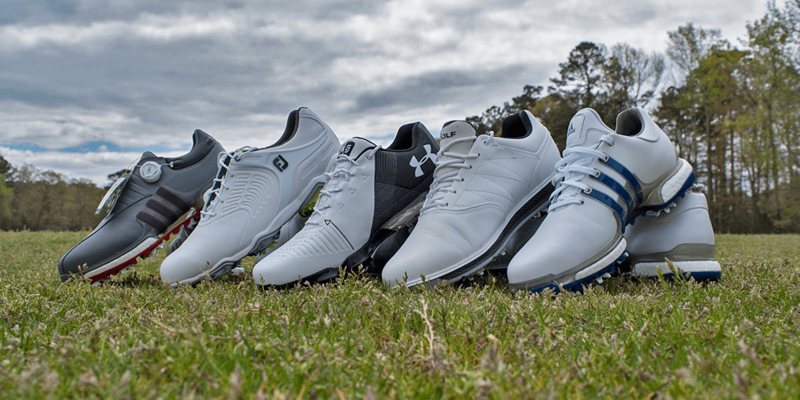 Golf shoes are changing, and they’re changing fast. In 2018 golfers demand a shoe not only look good but also provides comfort, right out of the box. It must also provide stability in the right places and be able to handle the harsh conditions encountered on the course throughout the entire season. 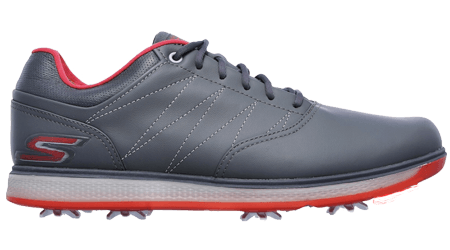 The aim of this spiked golf shoe buyer’s guide is to ensure you get the functionality of a spiked shoe with the comfort of your favorite sneaker. One key to our testing protocols is that we test products head-to-head. We select the top products from each category and put them through extensive and detailed head-to-head testing. We test both in the lab and in the field. We score each product across a range of weighted categories. We then rank the products, explain why, and give awards to the best performing products in the category. Our rankings are based on many factors. This includes the stability provided by the shoe throughout the round. The comfort of the shoe a golfer gets straight from the box and during the swing. The ability of the shoe to resist golf course conditions without breaking down. We also consider the style of the shoe, and the overall fit of the shoe all the way from the heel to the toe. In our spiked shoe category, we also looked at the design and functionality of the traction technology. We put in hours of testing utilizing data-driven protocols and enhanced metrics. Over the course of the test, golfers hit balls while wearing each pair of shoes. There were opportunities for breaks in the test to reduce sweat and limit tester fatigue. We also closely examined each shoe, looking at the insoles, midsoles, and outsoles for anything that could limit functionality or comfort. 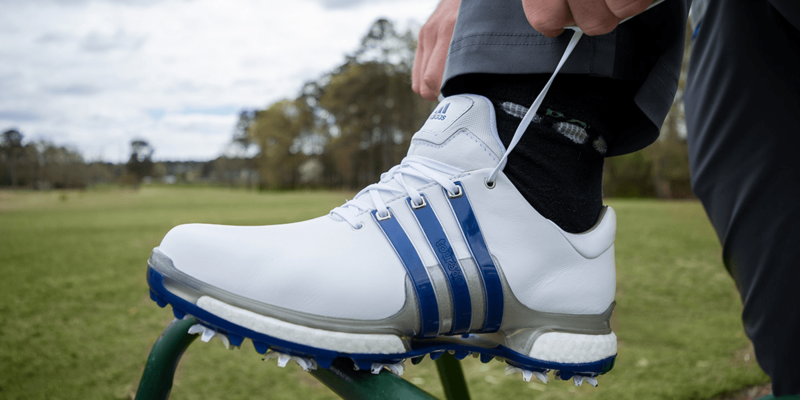 Stability (25 points) – How much support does the shoe provide throughout the golf swing? Does it stabilize the ankle? If the ankle moves, by how much and in which direction? We also test how far the ball of the foot and toes slide forward and laterally. We find that poor performing shoes allow the foot to move, roll, or slide instead of forcing them to turn. Shoes that performed well have effectively designed heel cups which help lock the ankle into place. These shoes create improved balance by way of the added lower body stability. We also notice shoes with either horizontal patterns and or slicker material on the insole allow the ball of the foot and toes to slide more during the swing. Elements (15 points) – On the golf course, one faces a variety of different conditions. A quality golf shoe must be able to handle these conditions. From dew to mud to rain a golf shoe must be able to keep your feet safe from the elements. The best shoes in this category have well-designed midsoles, uppers, and outsoles that seal the shoe from the elements. Style (10 points) – Score is established by considering what we believe the majority of consumers would deem stylish, not whether the individual tester likes the look of the shoe. Survey questions provided to testers were developed to combat any brand-driven favoritism on the part of the individual respondent. Traction (10 points) – No one likes slipping when hitting a shot on a golf course. Therefore, it’s critical that a golf shoe keep you grounded when hitting a shot. The best shoes in this category allow the golfer to swing without slipping. It should be noted; traction is not the same as stability. Final grades were awarded based on total scores. 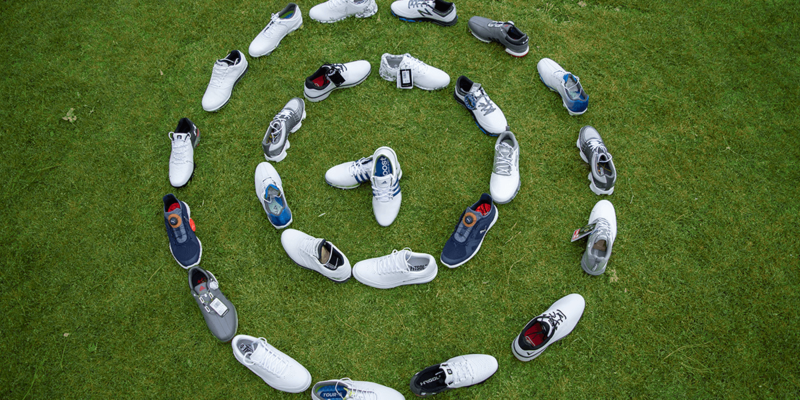 Best Overall is our highest overall scoring spiked golf shoe, and awards are given to the top five shoes. Also, more specific Best in Class recognitions are awarded to shoes in certain categories (like fit, comfort, and stability) that push the industry’s design envelope. Easy to secure with BOA technology. Slight crease from leather and rubs on big toe when walking. Owned the ADIDAS 360 for past 4 years, great shoe! 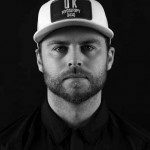 Heel rubbing is an issue on last years model with 2018 model reviewed in this article had no issues…2018 model is definitely the best shoe they have made to date! I concur! Adidas Tour 360 is the best shoe for MY foot. I’ve worn everything from BITE, FJ, Dexter (spikes), Callaway & Florsheim and I needed a modern shoe for walking and could take the elements. I also needed a firmer/supportive shoe and NOT a jogging shoe as those tend to cause arch problems for my feet. UA would be my second option to try as my son love’s his, possibly Ecco as their street shoes are comfortable but rather clunky. The Adidas shoes are great at cleaning off a green as, when new, those cleats will pick up EVERY leaf stepped on! One thing that makes the UA a true PITA is the proprietary cleats NOT SOLD at most stores. Not at PGA Superstore, Edwin Watts or your local club or even most club shops! They wear out quickly & hope you can find them eBay when needed because it’s easy to damage the screw base and then you’ll have to 5 Minute epoxy them in….one last time. I would be interested in the real test of a water proof shoe. I have yet to find a shoe that can keep your feet dry in heavy dew for 18 holes. Have any of these shoes been tested in such a manner? Realizing there is some validity in the ‘you get what you pay for’ concept, but there are only so many of us out there willing/able to pay for tour quality when it comes to shoes. How about a test for the majority of us out there, like ‘Best Shoe under $150″? FWIW, for the budget conscious folks, online retailers are a great place to find significant savings if you aren’t above wearing last seasons offerings. That’s where I found both pairs of my Boost 2.0s. Outstanding shoes. I keep trying Adidas but even their wide is way to narrow. I walk most of the time when playing golf, I recently purchased sketchers and after 9 holes I had terrible blisters on my heels and had to change to my street shoes. The heel area in the sketchers are very wide and large, there is nothing to hold your foot in place or stop unwanted rubbing. They also offered very poor stability on any hill and poor traction on any hill. Plus the oversized opening for your heel meant I often needed to remove debris from my shoe. I switched to Ecco and they are incredibly comfortable and great for walking, too bad they didn’t make your list. 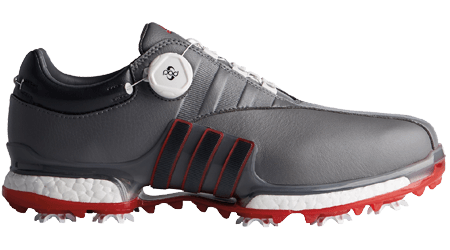 My old golf shoes were Adidas they were comfortable also but a bit more rigid for walking making the Ecco’s a little more comfortable for players who walk the course. This review is good for people with foot size, width, and shape within the majority of the bell curve. For somebody like me with an extremely wide ball of my foot and relatively squared off toe profile, many of these brands (like Adidas for example) don’t even offer a shoe that I can wear. I currently wear an old pair of Footjoy Classics that are EEE width and the toe profile is still a little too pointed. Does anybody know which brands are the widest? I know of New Balance and Ecco. Maybe Footjoy? Ecco wise width sneaker or street shoe style golf shoes are very wide, good luck. I find Ecco to be very comfortable. I would suggest avoiding sketchers they are wide in the heel area and narrow in the toe area. A very strange design, almost like a triangle. True Linksware have an extremely wide toebox but I don’t know what the company is up to these days since they have changed hands. I had read somewhere, maybe on this site, that they have returned to their roots and offer a nice wide shoe with a minimal heal drop. Maybe John knows. Worth the look. I use a shoe Foot Joy calls Special (available both spiked and non-spiked). It has a very well rounded toe box which is needs, as I have required prosthetic insoles. I can tie it strong and it lasts me well for a round+. You may have to look around to see who carries it. I purchased it for well under $100. The move to a more pointed tole to look stylish (as if that should be a requirement for a “good” shoe used only while actually playing the game) has taken most shoes out of consideration. Then again, I can’t recall looking at another’s shoes to give style points. As a long time wearer of Adidas Tour shoes I agree that they are the most comfortable and stable golf shoes I’ve ever worn. Although they tend to be a little heavier than others they are incredibly stable, and fit my somewhat narrow feet very well. I like the understated colorways too as well as their durability. And like many other shoes you can wear than straight out of the box too. I agree those Adidas are very nice. I would like to see how the the Ecco shoes would do. Appreciate the evaluation of the golf shoes. It would be nice if there were a chart showing WIDE shoes; some of us just have that issue, and it’s not easy finding shoes that cover most of the bases. I have a pair of Dry Joys that I’ve had for several years and MANY rounds and they’re still in great shape. Also have a pair of New Balance that are really comfortable, but don’t quite provide the support of the Dry Joys. 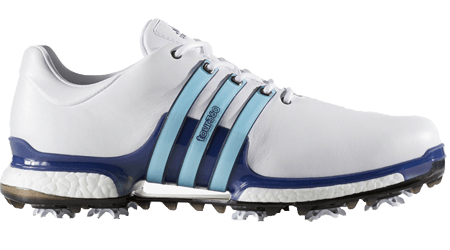 I purchased a pair of the Adidas Tour Boost 2.0 and they turned out to be the most uncomfortable golf shoes that I have ever worn. After just four holes on my initial use I could barely walk. It took my feet the rest of the day to recover. Thinking this was due to being new, I tried three more times but found they still created a problem for my feet. To say the least the pain became a huge distraction from enjoying the round of golf. I purchased a pair of skechers shoes and have been happy with their performance. I don’t understand the fascination that manufactures have with the high heel cup\counter – They just end up digging into my ankles and Achilles. I’ve got the Adidas tour 360 BOA and love them. Super stable, easy to walk in and very comfy. I have narrow feet and the BOA really keeps the shoe tight throughout the round. No slippage of laces. Also I have found sizes to be all over the place, I’m a 12 sneaker but an 11 in my Adidas. One other comment that I think is overlooked with any performance shoe…the insole. Or should I say, go buy a good insole. Balance starts with your feet, if you are not balanced, you can’t swing with efficiency or proper sequence. IMHO spend less on a shoe and spend the extra dough on a good insole. Try A-line, Prolatus, Superfeet. Don’t waste money on Dr. Sholls crap, it’s a waste if it doesn’t have a hard heel cup. Put them in regular sneakers golf shoes, hiking boots, etc…you’ll thank me. Thanks for the advice on insoles. I put some green Superfeet insoles in my Nike golf shoes and they feel awesome. I don’t think any shoes come with quality insoles and it makes a huge difference, especially walking 18 holes. It’s a shame you can’t go out and buy a few pairs of the ones not sent to you, but I understand there are costs and you’re not spending your spare cash on shoes, but instead on clubs. Still tho… I can see leaving out random brands like Ecco, but Nike? Tough…. And by “participate,” i mean send more than just one pair of their less popular shoes. It is up to the company to decide on what is sent and if they want to participate in the tests. “Nike one of the biggest and most popular golf shoes”. Really? Certainly not in New England. They seem to be dying up here. Not trying to be THAT guy, but they are extremely popular in the US, which is by far the largest golf apparel market. And I expect that to grow, considering that they pulled out of equipment manufacturing and are now 100% focused on apparel. The number of golf shoes they are releasing each cycle is noticeably more than before. They are also able to outfit more tour pros now, making them more visible to the general public. I would never buy a shoe that does not have a 2 year waterproof warranty. Really surprised that the Adidas and Skechers models do not provide this. Skechers does have a 2 year waterproof warranty. There’s a card or booklet in the box with the shoes that says so. Skechers has always had a 2 year waterproof warranty on their shoes! Ya where is the Ecco shoe, best shoe I’ve ever worn a little pricey but great fit if you have wide feet . Play lots of golf and they are like slippers no break in required. First is comfort if feet happy I’m happy. Yes. 27 years of golfing (2-3 times per week), Ecco Bioms are the best shoe I’ve ever used. Second is Adidas, but they fall apart quickly and Footjoy don’t suit my feet shape. Ecco only decided to send spikeless this year and not spiked. I guess, I must be getting old. I buy shoes for comfort first. That must be why I wear Skechers Go Golf spiked, when wet and spikeless when not. I had to smile and chuckle a bit when I read where you need a shoe that will hold up under harsh conditions. Is that where a sprinkler head pops up and wets you down when you least expect it? Comfort, traction, and budget…….don’t sweat the harsh conditions. I had a pair of Callaway’s and they leaked in under a year. My son had a pair of Callaway’s and the microscopic layer of leather broke and separated from the canvasy layer underneath, therefore letting in the water in under a year. I know we could have sent them back. But that’s hassle, instead our answer is simple we will not touch Callaways again. And you know what else? It kind of sours us to the brand more generally so their loss is more than future golf shoes from us. We both have Footjoys currently The price of my Footjoys was around the same as my Callaways and my Son’s were cheaper. Since getting my Footjoy’s I have played around 200 full rounds, often on hilly and wet courses (we live in Scotland!). They are still in top condition. I don’t see how anyone can not see the difference between the quality of the Footjoys and the Callaways. 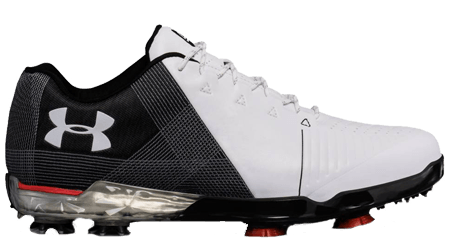 I have the first Under Armor shoes and the new Spieth model and the comments about the new Spieth model being stiffer are true. I have been using them to practice in hoping they will lossen up a bit . They do have a solid base. My favorite go to shoe is the Addidas 360, they look the best, are solid shoe, comfortable, and have a solid base. I am not a fan of the Sketchers look , they look like grandma shoes for the mall. I bought the Speith 2 shoes but even in a wide fitting, they are still to narrow in the toe box. They are also super stiff I sent them back. Classic looking unprecedented comfort that shames most shoes out there. Why they are not on the list I don`t understand. If it ain’t broke don’t try fix it. I’ve owned a pair of the Spieth 2’s now for 5 weeks and have played 8-9 rounds in them. Much of what you review states is true. They are a stylish, stable shoe with excellent traction. They are a bit small and am still struggling a bit to get my left foot into the shoe. They are rigid out of the box but as you stated above, have loosened up a bit but still have a little way to go. Aside from the initial fit, the only issue I’ve faced is that the shoe strings come loose easily. I re-tie my shoes 2-3 times a round which I’ve never had to do before. For a premium shoe I was hoping for a more comfortable fit out of the box, but I’m guessing it will be another few rounds before they’re fully broken in. Overall on a scale of 1-10 I would give them a solid 7. One word to solve your problem: BOA. Will never go back to laces. I’ve got a pair of these and couldn’t be happier with them. I’ve got high arches and a somewhat wide foot. They’re not narrow whatsoever and fit me perfectly. 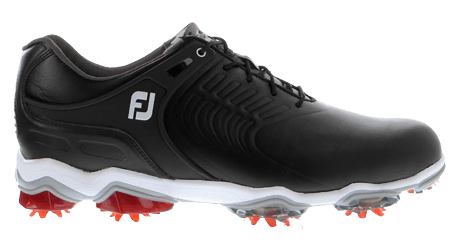 I compared them to the FJ’s and Speith’s which I found to have very narrow toe boxes. I’ve owned 5 or so pairs of Adidas golf shoes and they’re always comfortable and durable. High quality shoes IMO.